El pasado lunes 25 de agosto se celebró la 66 edición de los Emmy, los “Oscar” de la televisión estadounidense. La gala se trasmitió por el canal de cable Warner Channel y comenzó a las seis de la tarde. Curiosamente, la ceremonia tuvo lugar el lunes en lugar del habitual domingo, ya que esa noche eran los MTV Video Music Awards; de hecho, Seth Meyers—presentador de los Emmy de este año— hizo una pequeña broma al respecto durante su monólogo al principio de la gala: «Sí, MTV aún tiene premios para videoclips…». No hubo grandes sorpresas en cuanto a los ganadores de esta edición. Breaking Bad fue la gran triunfadora y la más galardonada, con un total de 5 Emmys: mejor serie de drama, mejor actor drama (Bryan Cranston), mejor actriz de reparto drama (Anna Gunn), mejor actor de reparto drama (Aaron Paul) y mejor guión (Ozymandias). Fue sin duda un merecido reconocimiento a una serie que ha reunido a miles de fans a lo largo de sus cinco temporadas, el perfecto broche a una de las series con más calidad de los últimos tiempos. No obstante, esto debió dejar un cierto sabor amargo a sus dos grandes competidoras, derrotadas este año: Juego de tronos, que se llevó los Emmys del apartado técnico principalmente, y True Detective, que únicamente recibió el galardón a mejor dirección de drama (aun así, sus dos protagonistas —Matthew McConaughey y Woody Harrelson— se lo pasaron en grande en el escenario cuando salieron juntos a presentar uno de los premios). Modern family fue reconocida una vez más como la mejor comedia del año. Recibió tres Emmys: mejor serie de comedia, mejor actor comedia (Ty Burrell) y mejor dirección en serie de comedia (Gail Mancuso por el episodio Vegas). Tanto los creadores y guionistas de la serie, como el magnífico reparto vuelven a demostrar que son imparables a la hora de hacer reír al público. En el apartado de miniseries, Fargo y Sherlock fueron las dos ganadoras. La primera, por mejor miniserie dramática; la segunda, por mejor actor en miniserie o film (Benedict Cumberbatch), mejor actor de reparto en miniserie o telefilm (Martin Freeman) y mejor guión en miniserie o telefilm. No hay que olvidarse tampoco de Julianne Margulis y Julia Louis-Dreyfus, quienes recibieron los Emmys a mejor actriz dramática por The good wife y mejor actriz cómica por Veep, respectivamente; así como Jessica Lange y Kathy Bates, quienes se mostraron bastante sorprendidas al ser nombradas como mejor actriz y mejor actriz de reparto en una miniserie, respectivamente, por su trabajo en American Horror Story: Coven. Aunque, sin duda, lo que convierte los Emmy, al igual que los Tony, Globos de oro o los Oscar en ceremonias tan especiales es la capacidad que tienen sus participantes de reírse de sí mismos y de hacer reír al público, de entretenerles en definitiva. No es nada sencillo mantener una audiencia durante más de dos horas, y ellos lo suelen conseguir. El momento más divertido de la gala fue el apasionante y descarado beso de Bryan Cranston a Julia Louis-Dreyfus cuando la actriz iba a recoger su premio. Al parecer, ambos actores habían trabajado hace varios años en la serie Seinfeld, en la que sus personajes compartían un beso en una escena. La actriz, bromeando, fingió no recordarlo en absoluto, por lo que Cranston aprovechó mas tarde para vengarse y protagonizar uno de los momentos más twitteados de la ceremonia. Y el momento más emotivo fue el homenaje al recientemente fallecido Robin Williams; el cómico Billy Crystal le dedicó algunas palabras de agradecimiento por los momentos compartidos y por todos los años dedicados a la profesión: «Durante 40 años, fue la estrella más brillante de la galaxia de la comedia». Last Monday 25th August was celebrated the 66th Annual Primetime EmmyAwards, the American television "Oscars". The ceremony was aired on Cable Warner Channel and started at six p.m. Interestingly, the ceremony took place on Monday instead of Sunday, as usual, since that night there was the MTV Video Music Awards; in fact, Seth Meyers –this year’s host for the Emmys– made ​​a joke about it during his monologue at the beginning of the show: «Yes, MTV still has an award for music videos...». There were no major surprises concerning the winners of this year’s edition. “Breaking Bad” was the big winner, with a total of 5 Emmys: Best Drama Series, Best Actor Drama (Bryan Cranston), Best Supporting Actress Drama (Anna Gunn), Best supporting actor drama (Aaron Paul) and Best Screenplay ("Ozymandias"). It was definitely a well-deserved recognition to a series that has brought together thousands of fans throughout its five seasons, the perfect brooch to one of the best quality series in recent times. However, this must have left a bitter taste to its two great competitors, defeated this year: “Game of Thrones”, which mainly received the Emmys of the technical section, and “True Detective”, which only received the award for Best Direction in Drama (even so, its two stars –Matthew McConaughey and Woody Harrelson– had a great time on stage when they came out together to present one of the awards). “Modern family” was recognized once again as the best comedy of the year. It received three Emmys: Best Comedy Series, Best Actor Comedy (Ty Burrell) and Best Direction in a Comedy Series (Gail Mancuso for the episode "Vegas"). Both the creators and writers of the show, as well as the fine cast demonstrate once again they are unstoppable when it comes to making people laugh. In the miniseries section, “Fargo” and “Sherlock” were the two winners: the first one, for Best Dramatic Miniseries; the second one, for Best Actor in a Miniseries or Film (Benedict Cumberbatch), Best Supporting Actor in a Miniseries or TV Movie (Martin Freeman) and Best Screenplay in a Miniseries or TV Movie. We should not forget either about Julianne Margulis and Julia Louis-Dreyfus, who received the Emmy for Best Drama Actress for “The good wife” and Best Comedy Actress for “Veep”, respectively; and Jessica Lange and Kathy Bates, who were quite surprised to be named as Best Actress and Best Supporting Actress in a Miniseries, respectively, for their work on “American Horror Story: Coven”. Although, undoubtedly, what makes the Emmys, as well as the Tonys, Golden Globes or the Oscars, special ceremonies is its participants’ ability to laugh at themselves and make the audience laugh, to entertain them ultimately. It is not easy at all to keep the audience attention for more than two hours, and they usually achieve it. The funniest moment of the show was Bryan Cranston’s sassy kiss to Julia Louis-Dreyfus when she was going to collect her award. Apparently, the two actors had worked many years before in the series “Seinfeld”, in which their ​​characters shared a kiss in a scene. The actress jokingly pretended not to remember at all, so Cranston later took revenge and starred in one of the most tweeted moments of the ceremony. 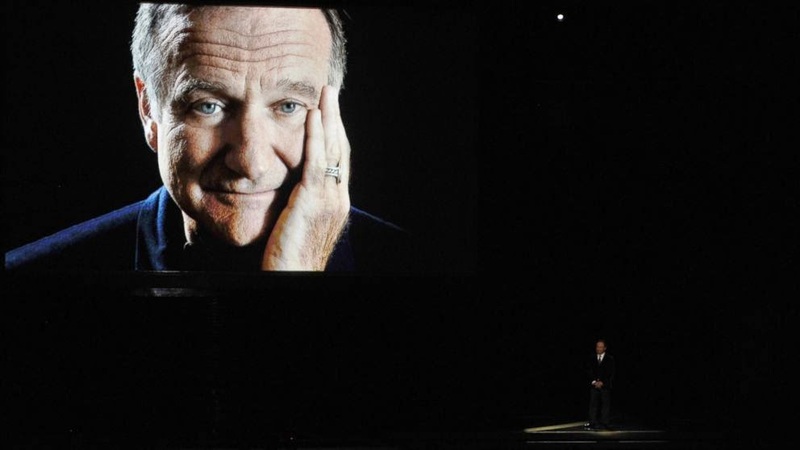 And the most emotional moment was the tribute to the recently died actor Robin Williams; the comedian Billy Crystal gave some words of appreciation for their shared moments and all the years Williams spent in the profession: «For almost 40 years, he was the brightest star in the comedy galaxy».